In 1993, Fox debuted a strange new television show called The X-Files. Little did anyone suspect that the series would become one of the network's biggest hits-and change the landscape of television in the process. Now, on the occasion of the show's 25th anniversary, TV critics Zack Handlen and Todd VanDerWerff unpack exactly what made this haunting show so groundbreaking. Witty and insightful reviews of every episode of the series, revised and updated from the authors' popular A.V. Club recaps, leave no mystery unsolved and no monster unexplained. This crucial collection even includes exclusive interviews with some of the stars and screenwriters, as well as an original foreword by X-Files creator and showrunner Chris Carter. 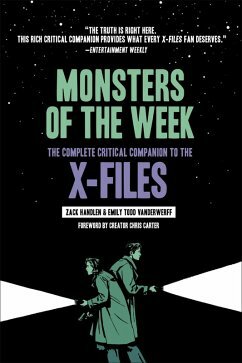 This complete critical companion is the book about The X-Files, the definitive guide whether you're a lifelong viewer wanting to relive memories of watching the show when it first aired or a new fan uncovering the conspiracy for the first time. Todd VanDerWerff is the critic-at-large for Vox and the first TV Editor of The A.V. Club . His work has also appeared in the Los Angeles Times , Salon , and Grantland . Zack Handlen is a freelance writer whose critical work regularly appears online at The A.V. Club . He has written for io9 , Inverse , and the now shuttered The Toast . He is the author of If You Like Monty Python (Limelight, 2011), an entry in Hal Leonard's If You Like... series.